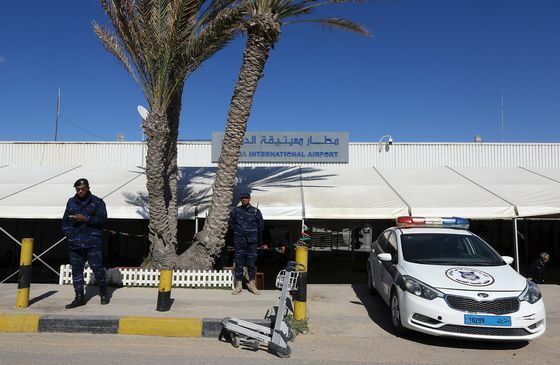 Mitiga International Airport, Libya’s largest, temporarily suspended flights after the airstrike, which the UN’s secretary-general, Antonio Gutteres, condemned. In a statement, Gutteres urged an immediate halt to hostilities ``to prevent an all-out conflict.'' Ahmed al-Mismari, spokesman for Haftar’s self-styled Libyan National Army, said his forces were targeting two military aircraft and were not intending to disrupt passenger traffic. 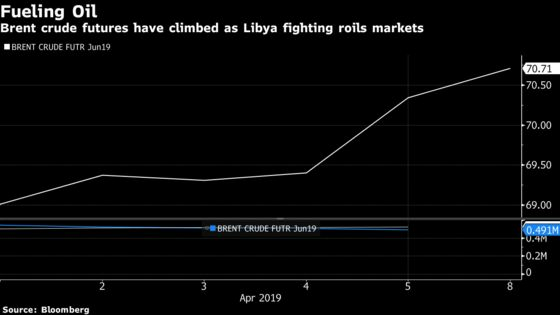 Haftar took even his foreign backers by surprise when he launched his advance on the capital last week, threatening to undermine a UN-sponsored conference to heal the OPEC member’s divisions that was planned for mid-April. His offensive has met with resistance from militia supporting the internationally-recognized government of Prime Minister Fayez Al-Sarraj, which is based in Tripoli. Sarraj has vowed to push the Benghazi-headquartered field marshal out not just from the capital, but from all the cities he has swept through over the past five years. Battle-hardened militias from the neighboring city of Misrata have sent reinforcements defend Tripoli. The battle for control of Tripoli is poised to turn into the bloodiest since the 2011 NATO-backed uprising that ended Moammar Al Qaddafi’s 40-year rule. Libyans struggled to build a unified state after the war. The ensuing chaos was fertile ground for the rise of militants, including Islamic State, while the North African country became a setting-off point for migrants heading across the Mediterranean to Europe. So far, the fighting has been far from the key oil installations but the potential for disruption was enough to rattle oil markets. Crude futures rose 0.5 percent in New York, holding near its highest level since late October. West Texas Intermediate crude for May delivery gained 31 cents, to $64.71 a barrel on the New York Mercantile Exchange as of 10:48 a.m. in London. Previous bouts of fighting and political standoffs have had a serious impact on the country’s ability to export crude, its main foreign currency earner. Tripoli’s nearest oil port is Zawiya, which is fed by the country’s largest oil field, Sharara. If the violence spreads, its activities could be threatened. The United Nations said the recent violence had already displaced 2,800 people, and appealed for both sides to accept a temporary ceasefire to allow emergency workers to move unhindered. But there was little indication that either side was inclined to step back. Sarraj, who has struggled to impose himself on myriad militia, is intent on retaining Tripoli and the few trappings of authority he holds. In command of the country’s most organized fighting force, Haftar has secured much of the country including its main oil production and export facilities. He views the capital, home to the central bank and National Oil Corporation, as the ultimate prize. The fighting has already left almost three dozen dead. International condemnation has been quick and sustained. Libya’s neighbor, Tunisia, appealed for calm, as did Egypt and the United Arab Emirates -- both of which share Haftar’s hatred of Islamists and have been among his supporters. U.S. Secretary of State Michael Pompeo said in a statement late Sunday that Washington was “deeply concerned” about Haftar’s threat to Tripoli. The U.S. also withdrew a contingent of troops that support the U.S. Africa Command. “A political solution is the only way to unify the country and provide a plan for security, stability and prosperity for all Libyans,” Pompeo said. France, which along with Italy has sought to iron out the differences between Haftar and Sarraj, was unaware of the eastern leader’s plans, a French official said. Paris has called on him to pullback his forces and take part in the UN-backed political process, the official, who asked not to be named under French government rules, said.